If gold is scarce, why not just dig some more? Gold has long been a popular choice as an investment. Yet as a metal, gold is too soft for many applications; it is the most malleable metal known. Gold is a good electrical conductor; copper and silver are better and much cheaper, although gold is less prone to corrosion. Yet none of gold’s physical properties justify it’s extremely high cost. 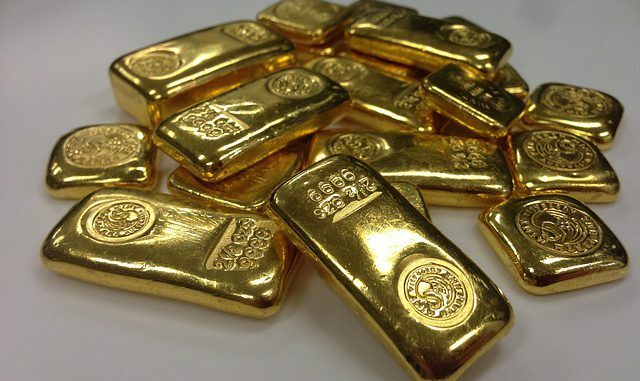 So what actually makes gold so expensive and desirable? It’s all to do with rarity. Gold is extremely rare. The total amount of gold mined in the entire history of mankind is less than 170,000 tonnes, about enough to only fill 3 Olympic sized swimming pools. Compare this to the mining of Iron (which is almost 850 million tonnes per year) and aluminium production (just over 30 million tonnes per year) then you can see gold is very scarce. So gold is a rare, precious, much sought after commodity, as such it commands a high price. 50% of gold is used for jewellery, 40% in bullion (as coins and bars), the rest a variety of industrial and medical applications. Centuries of Alchemists will vouch for the fact that gold cannot be created from base metal. Gold is a chemical element, atomic number 79 and has the symbol Au (after the Latin name aurum, which means ‘gold’). With the exception of the noble gases, gold is the least reactive element known. And it’s not that people don’t try to mine more, or that they just look in the wrong place. It’s simply that there’s not a lot of gold on the planet, period. And it’s not exactly in abundance in the entire galaxy. So where does gold come from? Gold is made when a star collapses and forms a supernova. This is such an exceptional event that in a Galaxy of 100 billion stars, the conditions for making gold only exist for less than one minute every century. So if you have some gold, it has come from a distant star that exploded many billions of years ago. It’s on this planet because that’s where the Earth was spit out from too. To make matters worse, 99% of all the gold is trapped in the Earth’s core. If we could get all of this gold we could cover the entire Earth with a nice shiny coating about half a metre thick. But this is not going to happen and we get the odd piece of gold thrown out by volcanic action. Many times geologists find gold but it would cost more than it was worth to excavate and separate it from other elements. Even when the layers were richer and more accessible as in the Roman days, miners would need to dig several tons of material just to get one ounce of gold. The value of gold will depend on its purity and its weight. Purity is expressed in a couple of ways. In Jewellery it is stated in Carats (spelt Karats in North America), 24 carat being pure gold. Base metal (usually copper) is added to the gold to make the metal harder, alter its colour or just to make it more affordable. 18 carat is 75% gold, 9 carat is 37.5% gold. Bullion is usually rated zero to one, so pure gold is classified as above 0.999 (99.9% gold), 9 carat referred to as .375. Gold is usually certified and carries assay marks or Hallmarks. Just watch you don’t buy a block of gold-plated lead! Weight is measured in a number of units and you should be careful to understand what is being offered. Gold is often quoted in US dollars per ounce (for example $1400/oz). The ounce here is the Troy Ounce which is 31.1034768 grams. Beware that other countries use the word ‘ounce’, for example the avoirdupois ounce (popular in UK, USA and Canada) is 28.3495231 grams. You may find dealers quoting Dollars per kilogram or Euros per kilogram. Price tends to vary from hour to hour. Although most countries have moved from the gold standard, gold is still considered a safe haven by many investors. Long term investment prospects are good as due to gold’s rarity it is unlikely to loose considerable value. In times of stock market volatility and international strife, gold tends to be a popular investment. It will almost certainly continue to be a rare and expensive commodity.